Rapp's two sacks against North Dakota on Saturday are a sign of Jimmy Lake's new aggressive play-calling plan. 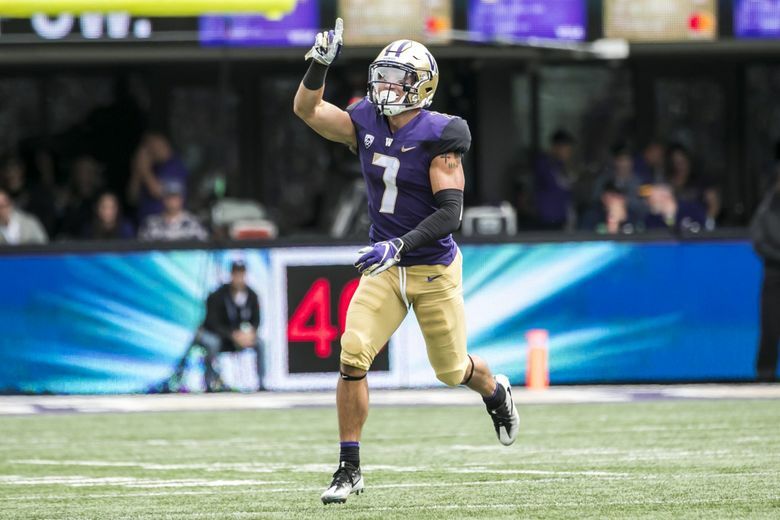 In preparation for his third season as the Huskies’ starting free safety, Taylor Rapp this offseason studied film of Khalil Mack and Aaron Donald, two of the NFL’s most-feared defensive players. The new hand-to-hand combat moves indeed came in handy Saturday in the Huskies’ 45-3 romp of North Dakota, when Rapp successfully converted two safety blitzes into two quarterback sacks. Those two sacks matched his career total from his first two seasons at UW. The Huskies’ new blitzing tendencies, especially from defensive backs, is through two games the most apparent wrinkle added to the Huskies’ defensive schemes by Lake in his first season as the play-caller. The pass-rush — specially: Where would it come from? — was the biggest question mark about this UW defense coming into the season. Lake, it seems, is willing to take some calculated risks to create a rush, and this offseason he told his defensive backs that they should expect to spend more time in the backfield — to hunt the QB. Lake also hasn’t been shy about calling a blitz for Myles Bryant, who even as a 5-foot-8, 182-pound nickelback is one of the Huskies’ best edge rushers. He had one sack against Auburn and nearly had another. Rapp, a preseason All-American, has worked with defensive line coach Ikaika Malloe and outside linebackers coach/co-coordinator Pete Kwiatkowski on pass-rush techniques, and loves the added responsibility. It’s not something he could have handled two years ago when he broke in as a starting safety as a true freshman. That evolution, Lake said, has afforded him to utilize Rapp in the same fashion he was able to utilize Budda Baker during his junior season in 2016. Even when he’s not going to blitz, Rapp can be equally as effective before the snap in making it look like he’s going to blitz — to “mess with the quarterback’s mind,” in his words.